Freezing temps, snow, and ice can put a damper on your regular exercise plans. Fortunately, these video games help you stay active right in your own living room. And because they’re games, they’re fun! This workout platform targets six areas of fitness: cardio, upper and lower body strength, balance, core strength, and flexibility. Each routine, designed by fitness professionals, is intended to give you results. Track your progress with exercise tests. Upload your own music and the game will match songs to different routines. The newest version of the Just Dance series is updated with the very latest chart-topping songs, along with recent favorites and classics. Test your moves by following each song’s dance choreography. The Just Sweat mode lets you create your own playlists and track your calorie burn. Voted a BAFTA Best Sports/Fitness Game of the Year, this collection includes a wide range of sports like soccer, football, boxing, darts, beach volleyball, and many, many more. This is one of the first full-body, controller-free sports games, making the playing experience very realistic. You can play solo or make it a team effort. More than just a game, Wii Fit starts by evaluating your fitness status, including your range of balance and BMI. With the Training features, get feedback on how well you perform different moves for activities that include yoga, strength training, aerobics, and balance games. By tracking your progress, you can see how your efforts pay off. If you love Zumba or you’ve wanted to give it a try, now you can keep up at home. Learn nine different Latin dances, like salsa, hip-hop, and mambo. There are 30 different routines to experience, each with high-energy Latin music that really gets you grooving. Play alone or with up to four people. 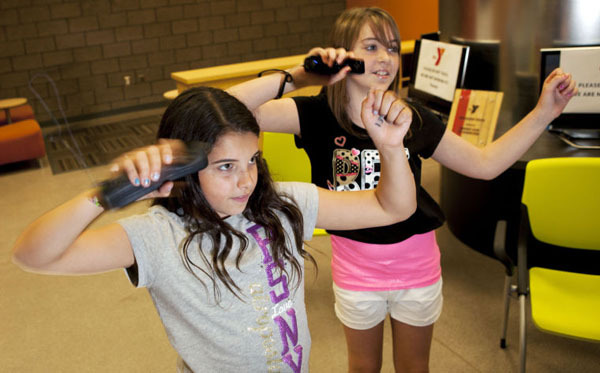 Video games are great way for keeping you moving and double as a fun activity with a friend or your family. Just keep in mind that they work best as one part of a healthy living plan that includes good nutrition, diet, and more rigorous exercise.